A wonderful way to start off a new year! 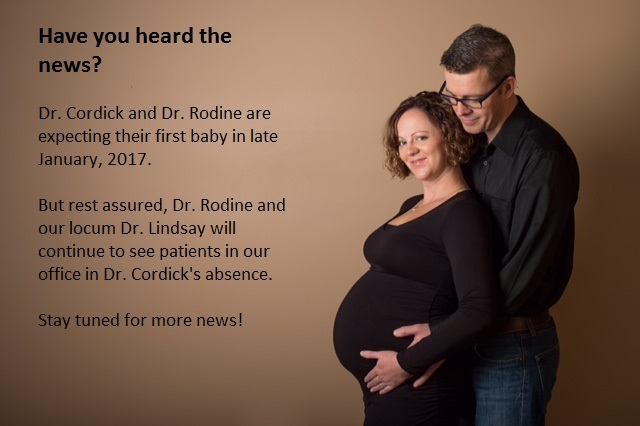 As Dr. Cordick and Dr. Rodine are currently expecting their first baby in January, we wanted to let all of our patients in on the exciting news. Dr. Cordick is continuing with her current hours and in her absence, Dr. Rodine and Dr. Lindsay will be happy to see you and ensure continuity of care. I wish you nothing but the very best. I cannot wait to hear when your precious bundle arrives.